Do you use gogs? Leave a review! YOU MUST READ Contributing Code BEFORE STARTING TO WORK ON A PULL REQUEST. Due to testing purpose, data of try.gogs.io was reset in Jan 28, 2015 and will reset multiple times after. Please do NOT put your important data on the site. 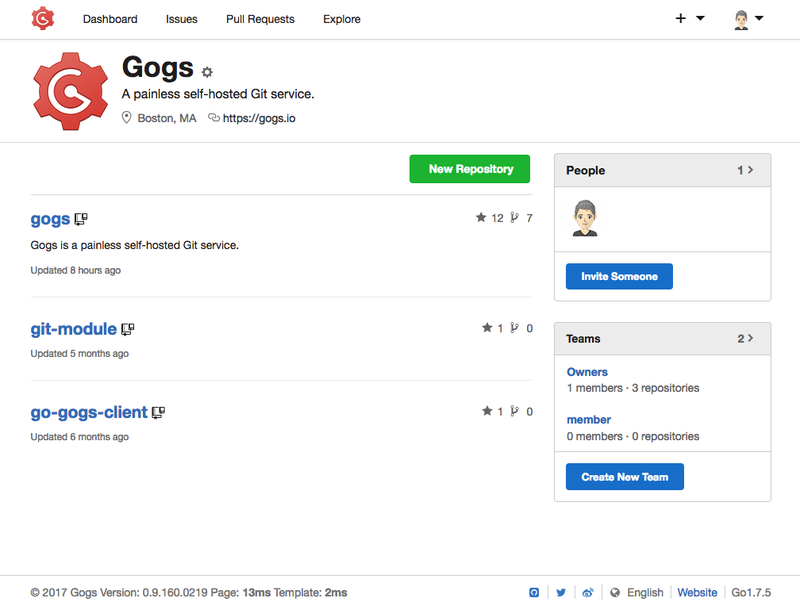 The demo site try.gogs.io is running under develop branch. If you think there are vulnerabilities in the project, please talk privately to u@gogs.io, and the name you want to be credited as. Thanks! 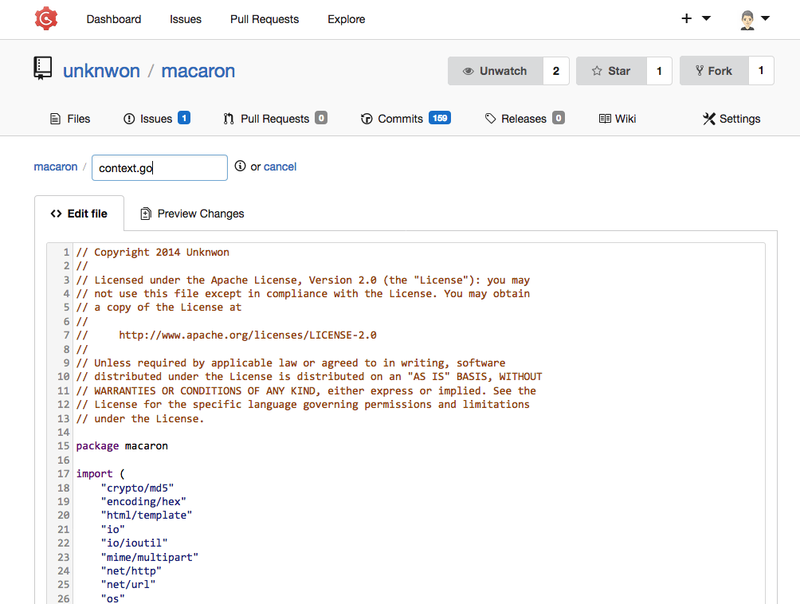 If you're interested in using APIs, we have experimental support with documentation. If your team/company is using Gogs and would like to put your logo on our website, contact us by any means. 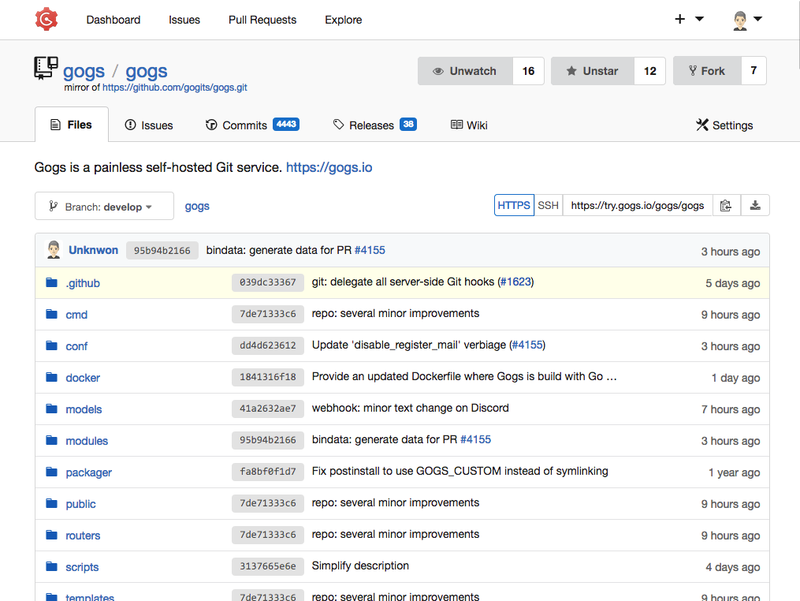 The goal of this project is to make the easiest, fastest, and most painless way of setting up a self-hosted Git service. With Go, this can be done with an independent binary distribution across ALL platforms that Go supports, including Linux, Mac OS X, Windows and ARM. Please see the Documentation for common usages and change log. Want to try it before doing anything else? Do it online! Having trouble? Get help with Troubleshooting or User Forum. Want to help with localization? Check out the guide! A Raspberry Pi or $5 Digital Ocean Droplet is more than enough to get you started. Some even use 64MB RAM Docker CaaS. 2 CPU cores and 512MB RAM would be the baseline for teamwork. Increase CPU cores when your team size gets significantly larger, memory footprint remains low. Please see Semantic UI for specific versions of supported browsers. The smallest resolution officially supported is 1024*768, however the UI may still look right in smaller resolutions, but no promises or fixes. Make sure you install the prerequisites first. Thanks Egon Elbre for designing logo. Thanks Crowdin for providing open source translation plan. 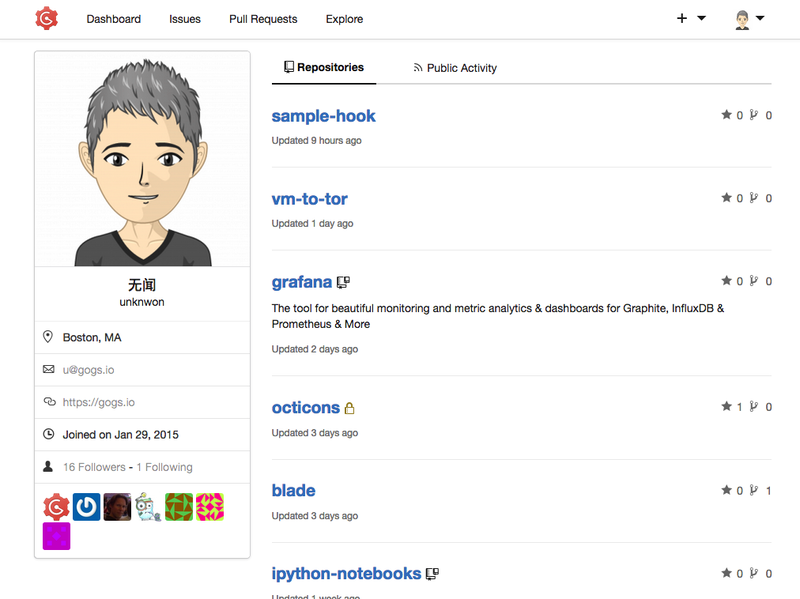 Thanks DigitalOcean for hosting home and demo sites. Thanks KeyCDN and QiNiu for providing CDN service. See contributors page for top 100 contributors. See TRANSLATORS for public list of translators. over 2 years ...go-libravatar expects import "strk.kbt.io/projects/go/libravatar"
over 2 years Why you deleted gogs v0.8.43??? 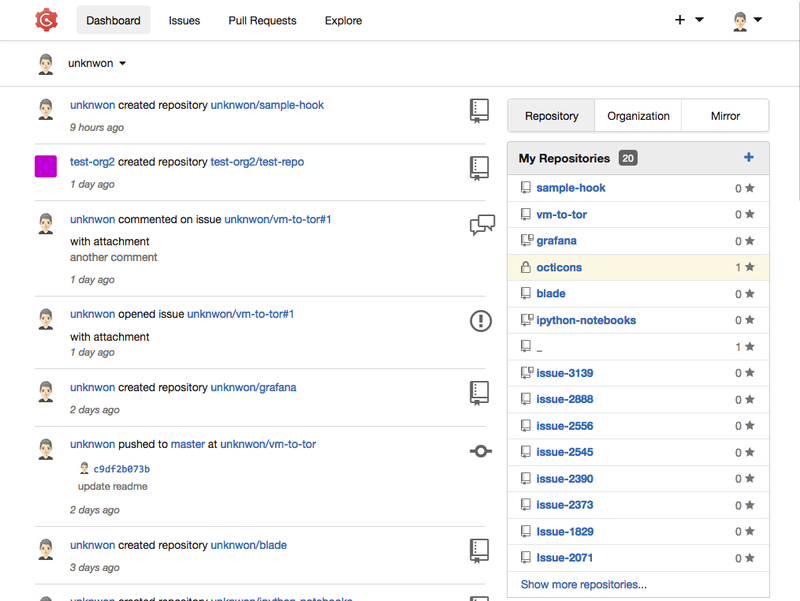 Improving issue and pull request templates. Added Units for repo, access and team. First step of three on #3027. 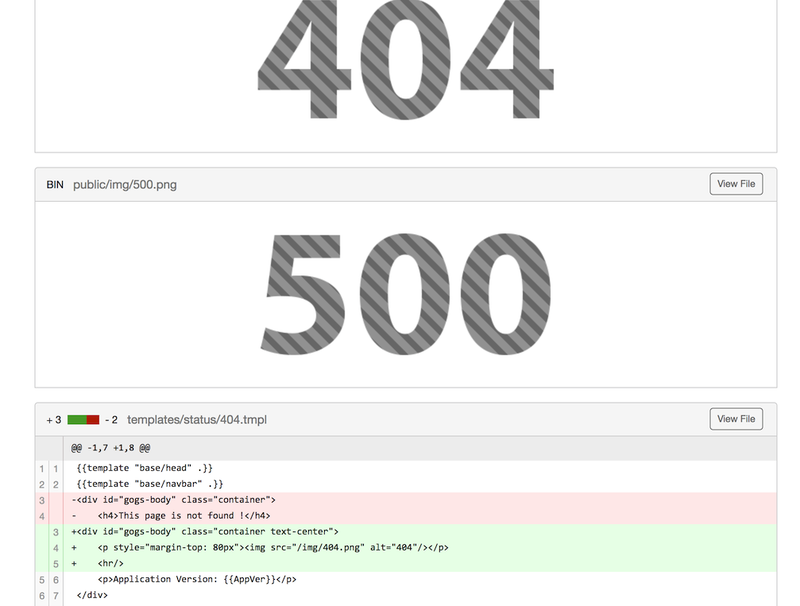 Re-work MAX_DIFF_LINES: supress diff per file, not the whole diff. Additional API support for labels. Implement branch deletion on PR merge (as an option). Closes #3201. Fix assigned/created issues in dashboard. Use temporary file to avoid out-of-memory when receiving big chunks. Actually use RUN_MODE in config.ini for what I think it is used for. Adds checking of reserved keywords against team names. 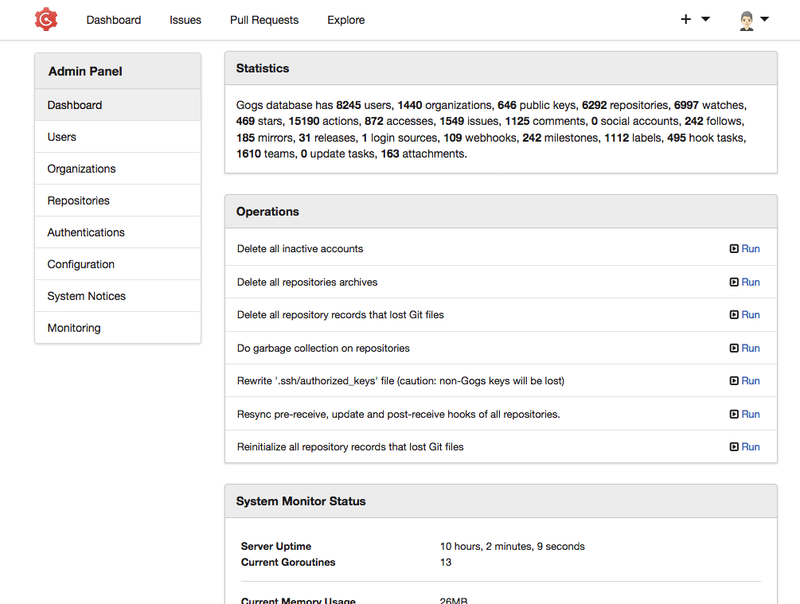 Check for zero length passwords in LDAP module. [mod] readme: update YunoHost package link. Verify repository is not bare before retrieving blob (Fixes #3992). Fix for downloading zero bytes files. 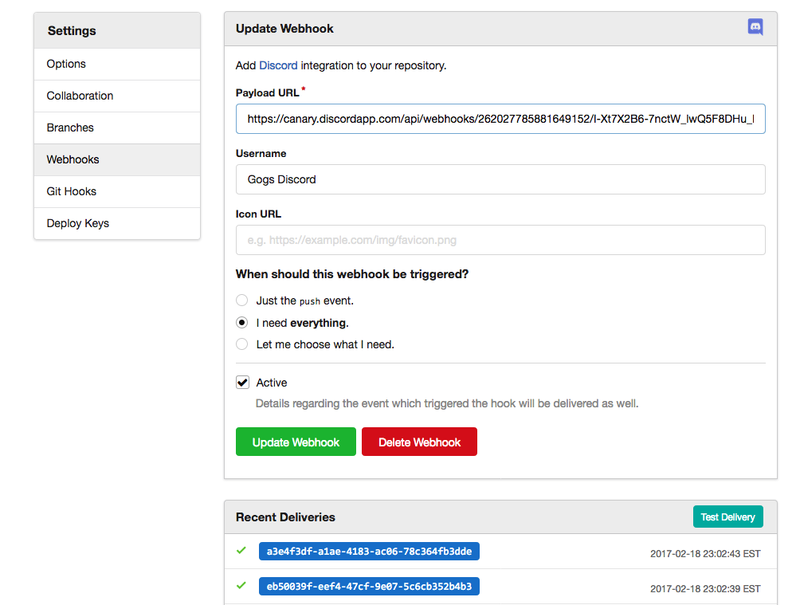 Made the webhook timeout duration longer. Use identicon image as the default gravatar. Keep up with changes to gogs! Would you tell us more about gogs?